Biking has really been picking up speed lately. I hear more and more people talking about it as a main form of transportation and events like Slow Roll have grown from a 100 person ride to a 1,000 person ride over this summer alone. Biking was the best way to get to DIY last week if you lived in Ferndale or Royal Oak and a lot of my friends in the city use their bikes to go everywhere from grocery shopping at Whole Foods to bar hopping on the weekends. If you are one of the people that enjoys biking and feels that it is the future of transportation, you may be interested in a panel discussion being hosted in the city this week. 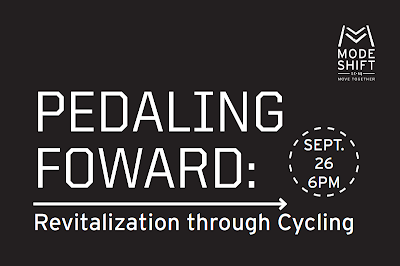 Pedal Forward: Revitalization Through Cycling will be held on Thursday, September 26th at 6 p.m. at Trinosophes Gallery at 1464 Gratiot in Detroit. They will be having a discussion of the bike culture in our city and the part it can and will play in the rebuilding of this once great metropolis. Tickets for the event are available for donation and any amount is acceptable. You can buy them in advance at pedalforward.eventbrite.com. Let's pedal Detroit into a better future! Child Bite Split Release Show with We Are Hex! Win Tickets to The Chop Tops at Small's!!! Stolas and Strawberry Girls at Paycheck's!!! Win Tickets to Electric Six at St. Andrew's!! !